Mid-summer here in Cape Town. The frost is tooth paste splatter - the house is smelling particularly minty at the moment. All home bakes - we take Christmas really seriously in this house. My diningroom door, garden umbrella in the background, draped with winter fleece sheet - at least something was really wintery in this shot :-P Yeah I know they didn't have electric lights way back then in Victorian Europe when the Little Match Girl was first around...poetic license. Oh and (almost ashamed to admit this) the light on her face is a flashlight which my son is pointing at her - it was trial and error so as not to get a hard spot of light which tended to make her look like Rudolph. Found he had to kneel down low and point it up at an angle to diffuse the edge of the "spot". But happy to accept the blue ribbon. Thanks guys!! It is your model's expression that carries this beyond the chocolate box. (Loved the notes). ETA: Details and lighting just the right degree. Message edited by author 2009-01-06 00:21:36. Toothpaste splatter eh? :) Nice creativity and big congrats on your ribbon! I've only just started voting but missed this Challenge. But in looking at this challenge this shot immediately grabbed me. I, too, wondered how the "posed" aspect would hit with the folks here. For me, posed is just swell. I am really delighted this one got the blue! It is such a beautiful compostion and image. I don't know the story (i hope to get to know of it soon), but I do like the picture! It was interesting to read your description. Congrats on the wonderful shot, set-up, and the subsequent blue! 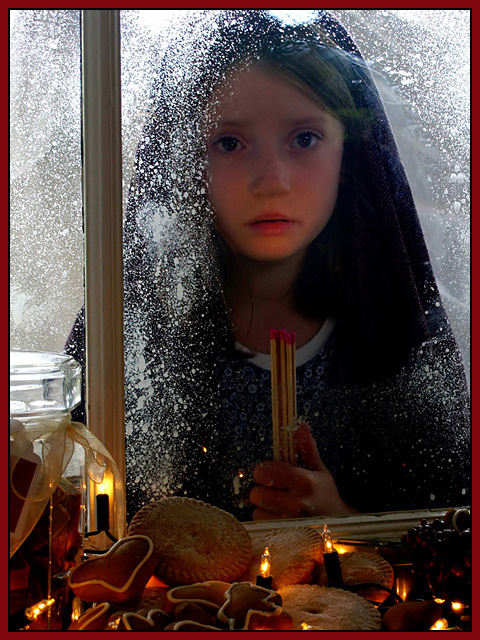 The little match girl is a story that has moved me for many years. I didn't get to vote in this challenge, but I am very glad this won. It is a beautiful setup and compliments the story well. I would have never guessed her face was lit by a flashlight. Well done. I knew this would be the winner when I saw it. Absolutely beautiful. Congratulations. I think the expression on the girl really makes this shot jump up beyond the others. Not technically perfect, but far surpassed in raw emotion and sense of presence. It is a wonderful change for front page images. I'm not sure why I didn't comment during voting, but this photo got a 9 from me. Excellent job and very deserving of a win! Keep up the good work. Oh! and I am not a fan of frames but this one happens to be particularly well suited. I absolutely love shots that were cobbled together with things like toothpaste spatter and children holding flashlights. A hearty well done! Congratulations; sorry my first comment was too blunt for you. Btw, I think real credit goes to your daughter here, who is apparently quite the young actress. Very deserving win. Love it!! Congrats on your Blue Ribbon. Congrats this was my pic(forgive the pun) to win. I knew this was the winner on first look. Congrats! A fantastic rendition. There was no doubt about this one scoring high. Certainly well deserved Blue! Congrats. Beautifully creative. Congrats on your ribbon. I knew this would be the winner, congrats!! WOW! This is a museum piece! CONGRATULATIONS on perfection in a them that is tough to get technical perfection. P.S. I just read how you got the shot, and I am even more in awe. Your creativity is brilliant, and I think the sensitivity to set-up shots is only when it is executed so flawlessly that it doesn't LOOK all that set-up. You NAILED it! Congratulations again! Message edited by author 2008-12-31 09:08:49. Congratulation on a beautiful photo. I thought it would be a winner! Lovely shot. Congrats on the blue. Congratulations Caroline. Baie mooi en 'n ware wenner. Very nice and a real winner. From an ex-Capetonian. Love your notes!! Sounds like you guys had a blast doing this and you certainly convinced me it was winter! Congrats on a well-earned blue! you are one fierce toothbrusher! congrats! I was one of those 10s! Great job! Well done! Congratulations on the ribbon Caroline! This was my top pick its just perfect! Congratulations!! Congrats on your first blue! congrats what a way to finish 08 huh? Congratulations on your well deserved win. This shot is gorgeous. Brilliant. Hope for top 3 for you. Ribbon winner! Excellent work far surpassing the rest. 10 (first in a while and only one over 7 in this challenge). The frame is a mistake, but otherwise nicely done. I really like this picture, especially the coloring and layout. I think you nailed it. I'll see this one in the top ten, if not a ribbon. Beautiful shot, I would like it better without the window frame competing with the girl. ehhhh this photo combines the challenge with the Christmas and a Christmas fairy tale. the composition is good, the colors seems naturals, there aren't technical errors.... there are all the ingredients for a great result. like the smooth tones of the image, the sharpness is exactly balanced. This has to be one of the winners. I think it is outstanding in every way. Woah, an amazing shot. Beautiful colors and fantastic composition. I love how the ice on the window is a frame for her face. Definite ribbon contender here. (No vote) Well done Caroline, looks beautiful. I love the warm tones reflected on Lily's chin - she really looks cold out there (which is an accomplishment because it was probably 30 degrees celcius!). This is my No.1 pick of the entries - 10 - should easy ribbon. Not quite the subject but for those whom know the story it is very powerfull and well done. As I do know the story I will go for a ten! Proudly hosted by Sargasso Networks. Current Server Time: 04/18/2019 06:44:37 PM EDT.